Accessing Command Line Interface (CLI) via Telnet, SSH, serial cable or even keyboard and monitor if your router has a VGA card. Every router is factory pre-configured with the IP address 192.168.88.1/24 on the ether1 port. The default username is admin with no password. After you log in for the first time, please create a new user with a password in the "full" group, re-login and delete the default admin user. We highly recommend you to follow the general guidelines of the article Securing your router to protect the device from any unauthorised access. Additional configuration may be set depending on RouterBOARD model. Most models have the ether1 configured as a WAN port and any communication with the router through that port is not possible, since it is firewalled to protect from any outside access. List of RouterBOARD models and their default configurations can be found in this article. 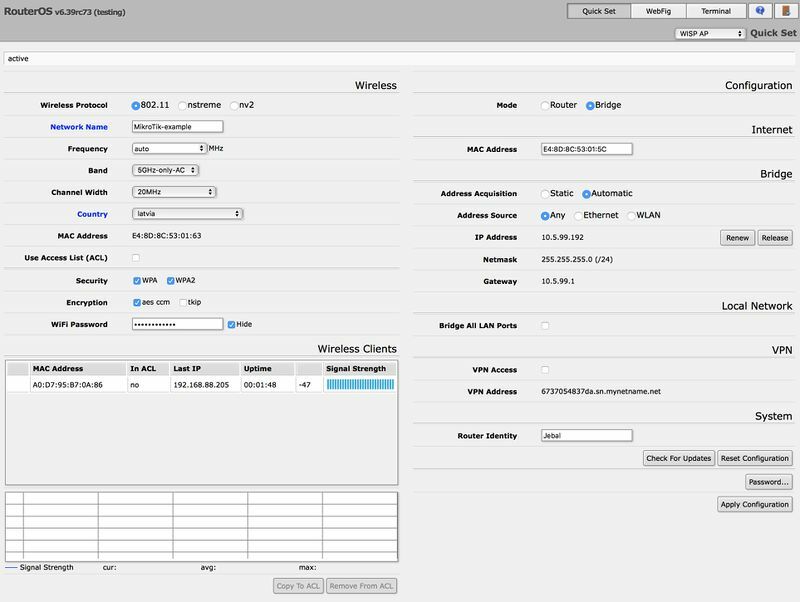 Winbox is a configuration utility that can connect to the router via MAC or IP protocol. Latest winbox version can be downloaded from our download page. Winbox will try download plugins from the router, if it is connecting for the first time to the router with current version.
) As MAC connection works on Layer2, it is possible to connect to the router even without proper IP address configuration, but might be required due to most driver not enabling IP stack if there is no IPv4 configuration. Due to the use of broadcasting MAC connection is not stable enough to use continuously, therefore it is not wise to use it on a real production / live network!. MAC connection should be used only for initial configuration. Follow winbox manual for more information. 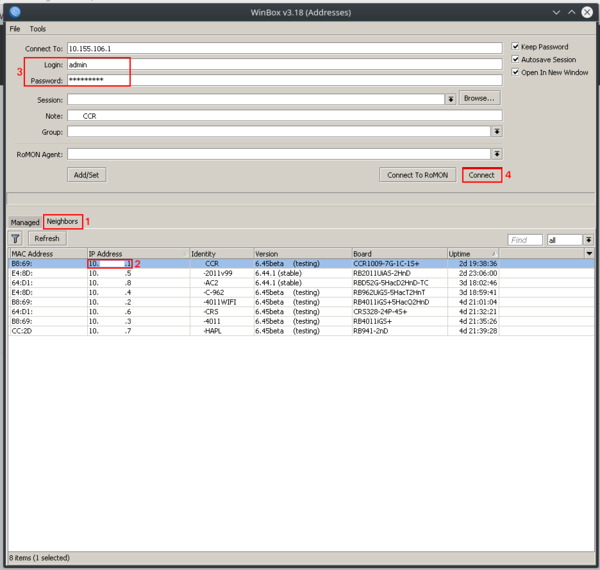 If you have a router with default configuration, the IP address of the router can be used to connect to the Web interface. The first screen to come up will be QuickSet, where you can set the password and basic settings to secure your device. For more advanced settings, click the WebFig button to open the Advanced mode, which has almost the same configuration functionality as Winbox. Command Line Interface (CLI) allows configuration of the router's settings using text commands. Since there is a lot of available commands, they are split into groups organized in a way of hierarchical menu levels. Follow console manual for CLI syntax and commands. 115200bit/s, 8 data bits, 1 stop bit, no parity, flow control=none by default. 9600bit/s, 8 data bits, 1 stop bit, no parity, hardware (RTS/CTS) flow control by default. Detailed description of CLI login is in login process section. Now you can start configuring the router, by issuing the setup command. This page was last edited on 19 March 2019, at 14:26.